National Cadet Corps is a Tri-Services Organization comprising the Army, Navy and Air Force, engaged in grooming the youth – 'The Leaders of Tomorrow' – into disciplined and patriotic citizens. 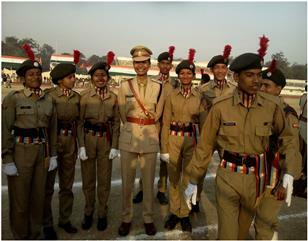 National Cadet Corps(NCC) is a premier youth organisation which functions directly under the Ministry of Defence. It functions at a National level to train the young boys and girls to be better citizens and future leaders of our country. The NCC has its genesis in the University Corps (UC) which was created under the Indian Defence Act, 1917, with the objective of making up the shortages in the Army. In 1920, when the Indian Territorial Act was passed, the University Corps was replaced by the University Training Corps (UTC). In 1942, the UTC was renamed as the University Officers' Training Corps (UOTC). A Committee under Pandit H N Kunzru was set up in 1946 at the behest of the first Prime Minister Pandit Jawaharlal Nehru. The recommendations of this Committee paved the way for the formation of NCC. Thus, the National Cadet Corps (NCC) came into existence on 15 July 1948 under the National Cadet Corps Act (No.XXXI of 1948) enacted by the Parliament. In 1949, the Girls Division was raised in order to give equal opportunities to school and college going girls.The NCC was given an inter-service image in 1950. when the Air Wing was added, followed by the Naval Wing in 1952.In the same year, the NCC curriculum was extended to include community development / social service activities as a part oft he NCC syllabus at the behest of Late Pandit Jawaharlal Nehru who took keen interest in the growth of the NCC. Presently, NCC has approximately 13 Lakhs Cadets under its fold. To develop character, comradeship,discipline, leadership, secular outlook, spirit of adventure and the ideals of selfless service amongst the youth of the country. To create a human resource of organised,trained and motivated youth, to provide leadership in all walks of life and be always available for the service of the nation. The motto of NCC is "Unity and Discipline". 'Unity' implies our basic oneness, the brotherhood of all the Indian people regardless of their caste, colour or creed. Likewise, 'Discipline' is the very bedrock on which any nation is founded. It is for these reasons that "Unity and Discipline" has been adopted as motto of the NCC. "I do hereby solemnly promise that I will serve my motherland most truly and loyally and that, I will abide by the rules and regulations of the National Cadet Crops Further under the command and control of my commanding officer I will participate in every camp most sincerely and wholeheartedly". We cadet of the National Cadet Corps, do solemnly pledge that we shall always uphold the unity of India. We resolve to be disciplined and responsible citizen of our nation. We shall undertake positive community service in the spirit of selflessness and concern for our fellow beings. At the Headquarters level, this organization is headed by an officer of the rank of Lieutenant General. He is the Director General of the NCC. Two other officers of the rank of Major General, five Brigadier level officers and other civil officials assist him. The Headquarters is located in Delhi. There are 17 Directorates located in the state capitals headed by an officer of the rank of a Brigadier from the three Services. Depending upon the size of the state and growth of NCC in the states, Directorates have up to 14 Group Headquarter sunder them through which they exercise their command and control of the organisation in the state. Each group is headed by an officer of the rank of Colonel or equivalent known as Group Commander. Each NCC Group Headquarters control 5-7 units (Bns) commanded by Lt. Colonel/Major or equivalent. Each Battalion consists of companies which are commanded by the Associate NCC Officer (ANO) of the rank of lieutenant to major. In all there are 95 Group Headquarters in the country who exercise control over a network of 667 Army Wing Units (including technical and girls unit), 60 Naval Wing Units and 61 Air Squadrons. There are two training establishments namely Officers Training School, Kamptee and Women Officers Training School, Gwalior. Total Thirty five training period for SD and SW is 3 years with an extension of 1 year permissible & training period for JD & JW is of 2 years. Every cadet of the Senior or Junior Division has to undergo service training for a period of at least 4 hours per week during the training year. However, no training is carried out during periods when the college or school through which a cadet is enrolled is closed for a vacation. Every cadet of the Senior and Junior Division has undergo service training for a minimum period of 75% of total hours during the annual college and school session. Every cadet during the training year to attend an annual training camp of 10 days duration for Senior Division, Senior Wing, Junior Division, Junior Wing. 2. Certificate - B : It can be written by SD / SW cadets of NCC, cadets after class 10 & those studying for +2, +3 (degree). In the second year of training they can appear for the same. 3. Certificate - C : It is the Most important certificate for NCC cadet. Now it can be written in the 3 rd year of training, in the 3rd year of degree course / those having B certificate can write it in the first year after his +2 and in the 1st year of degree by SD / SW cadets only. Three grades are awarded (1) A grade, (2) B grade, (3) C grade. The best grade is A grade, which has the highest value. An Official Song of the NCC titled “Kadam Mila Ke Chal” was adopted in 1963. This was, however, changed to the current NCC Song titled “Ham Sabh Bhartiya Hain” in Oct 1982. “Ham Sabh Bhartiya Hain” - NCC song is written by Sudarshan Faakir. Apni Manzil Ek Hai,Ha, Ha, Ha, Ek Hai,Ho, Ho, Ho, Ek Hai. Ha, Ha, Ha, Ek Hai Hum Sab Bharatiya Hai. This Camp is conducted at battalion level to impart practical training in weapons, map reading, communications and firing. The emphasis is given on community living. Through these camps cadet get an opportunity to develop and expose their hidden qualities. Maximum number of cadets are included in these camps and cadets potential is identified for the forthcoming Thal Sainik Camp and Republic Day Camp. These camps are conducted on an all India basis and help bridge the cultural gap among various states of India. 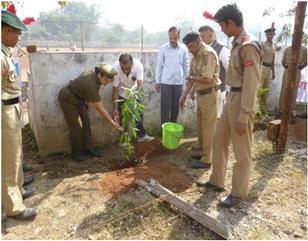 37 such camps are conducted every year. Our country being vast is varied in culture, customs and traditions which is a matter of pride to all. 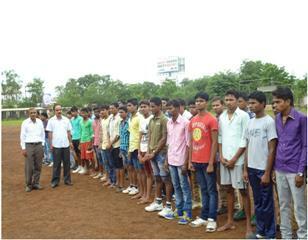 To acquaint the cadets with such diversity, selected cadets from every directorate participate in these camps. Cadets get an opportunity to learn the culture and language of different states. In addition, we conduct NICs at remote and forward areas to promote national integration. Special NICs are being conducted regularly at Leh, Srinagar, North Eastern Region and at Port Blair. These camps are conducted on an all India basis. There are four Advance Leadership Camps (ALC), one each for SD, JD, SD Naval Wing boys and SW Girls. Three Basic Leadership Camps are held, one each for SD boys, SW and JW Girls. Eight rock climbing camps are held each year to expose the cadets to the basics of rock climbing and to inculcate spirit of adventure. Four of these camps are held at Gwalior in MP and other four camps at Nayyar Dam near Trivandrum in Kerala. Every year 3 camps at battalion level, 3 camps at directorate (State) level and the final camp at National level in New Delhi are organized. Competitions in communications, Map Reading, Firing, Cross Country and Medical (First Aid) are conducted. The process of screening and filtering of cadets is done at each of the 3 camps at battalion level. The selected cadets participate in the inter-group competitions. Successful cadets again undergo the procedure of screening and filtering at the national competitions. The points scored by the cadets at final competitions are counted for the award of the prestigious Prime Minister‟s Banner. Republic Day Camp is a prestigious camp inaugurated by the Vice President of India and visited by Raksha Mantri, Raksha Rajya Mantri, Chief Minister of Delhi, the three Service Chiefs and other dignitaries. During the Camp, a Horse Show and three Cultural Programmes are held wherein important dignitaries are invited as Chief Guests. 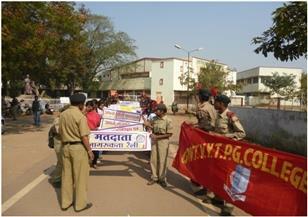 The camp culminates in the Prime Minister‟s Rally on 27 January every year which showcases all the activities of NCC. 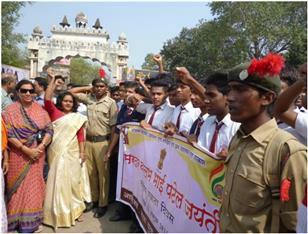 In addition, groups of NCC cadets meet the President of India and the Prime Minister over tea on separate days. 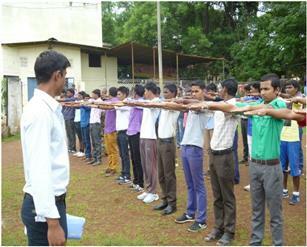 The procedure for selecting the cadets for RDC is same as Thal Sainik Camp. The main focus in these camps is on drill, cultural presentation, general knowledge and adventure activities. The points scored in these camps are considered for the award of prestigious Prime Ministers Banner. These camps are attached with regular army. 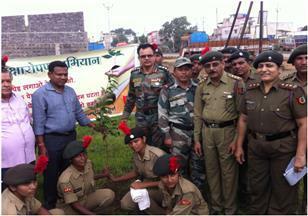 The aim of these camps is to give field training to the cadets and the cadets acquaint them with army exercises. 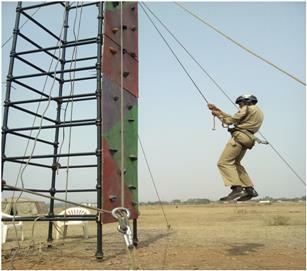 These camps are organized to develop courage and leadership qualities among the cadets. These camps enable the cadets to develop decision making ability, learn the manner of struggle for existence and survival of the fittest. Some of the adventure camps are Mountaineering, Scuba Diving, Trekking, Para Ceiling etc. 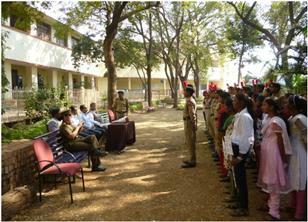 These camps are organized to develop courage and leadership qualities among the cadets. These camps enable the cadets to develop decision making ability, learn the manner of struggle for existence and survival of the fittest. Some of the adventure camps are Mountaineering, Scuba Diving, Trekking, Para Ceiling etc. · Indian Army as Commissioned officer. 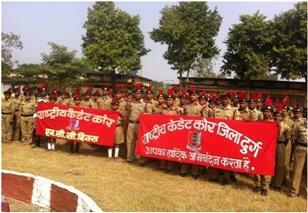 · NCC cadets are given preference in enrollment of soldiers. 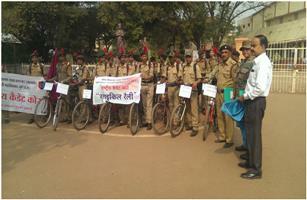 · ‘B’ & ‘C’ certificate holders are given preference in state police service. · C.G. Board offers Bonus marks to NCC cadets in Class 10 and 12. · 2% & 5 % bonus marks are given to NCC cadets at college level admission . · Sahara Scholarship- Rs. 6000. · Cadets Welfare Society Scholarship- Rs. 6000. · DG, NCC Scholarship- Rs. 6000. Our college is established since 1958 at Hindi Bhawan,Durg (C.G. ),In order to inculcate national sprit & discipline among students.NCC Army Wing was started in College 1963 further from the year----2003 the Girls Wing of NCC was also introduced the College Comprises both Senior Division (Boys) and Senior Wing Cadets (Girls).The College NCC Plantoon holds A Company which comes Under 37 CG BN NCC,Durg (C.G.) 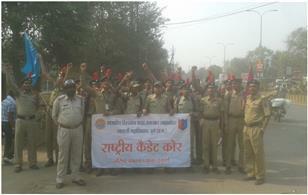 of Raipur Gp.,Madhya Pradesh & Chhatishgarh NCC Directorate,Bhopal. The NCC Army Wing has been nurtured by CAPTAIN R.K.SHRIVASTAVA (01-03-1963 to 21-12-1963), CAPTAIN J.D.KALE (01-07-1964 to 30-09-1966), Lt.D.P.SHARMA (01-07-1965 to 14-11-1969), CAPTAIN P.N.PANDEY (01-08-1967 to31-07-1968), MAJOR J.P.SHARMA (21-07-1968 to 31-07-1988), MAJOR B.VISHWAKARMA (23-11-1970 to 22-11-1980), Lt.S.D.PANDEY (06-01-1971 to 24-02-1979), MAJOR A.K.VISHWAKARMA06-09-1985 to 31-07-2005), in the past. To train volunteer youth to become confident, committed and competent leaders in all walks of life. 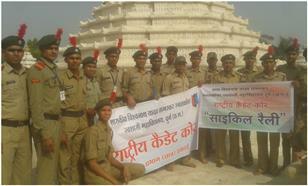 To enhance the awareness level of cadetsfor being responsible citizens of the country. Provide opportunities and encourage cadets to enhance their knowledge / awareness levels on life / soft / communication skills, character building / personality development. Conduct activities to provide value based contributions towards society in terms of social and community development. 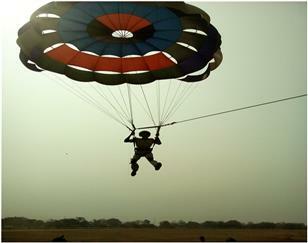 Undertake adventure activities for development of leadership qualities and risk taking abilities. Provide a platform to launch "good-will ambassadors" cadets to project the image of the country overseas. Provide an environment to motivate cadets to join the armed forces as a career. Authorised strength of the Senior Division (Boys) is 53 and Senior Wing (Girls) is 73. Every year in first year of NCC Training new cadets are enrolled, which is equal to the number of cadets passed 'C' Certificate exam last year, plus number of drop outs if any ie. Total Authorised strength is maintained as above. Enrolment of the cadets is carried-out as per NCC Act, in the presence of ANO, Principal, and Commanding officer’s nominee, in the month of July, once the academic admissions are over. Sufficient space for office and store room. 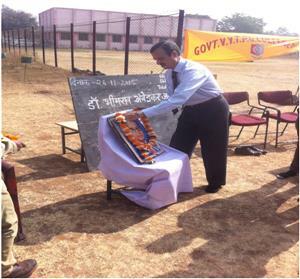 Ample space of Parade Ground and additional paver block fitted (metaled) Space to conduct Drill. Well experienced teaching staff ie. Associate NCC Officer and Visiting P.I. Staff for Field training and Weapon Training. Sufficient Teaching aids- 04 Dummy Rifles 01 Dummy prismatic compass and Army Map. Dummy Rifles for Aiming Practice. Dummy Prismatic compass, Maps, Service protractors used for Map setting and field training. Comprehensive training for 'Empowerment of Youth' to earn the 'Right to Lead'. (i) Character building and Competence Development. Innovative, interesting and safe conduct of training with high degree of visibility to inspire youth, duly supported by appropriate training infrastructure and logistics support for cadets. Training Programme and syllabi is framed by NCC organization at national level. 2. Parade days and Timing : 2 days in a week. 3. Training Staff : ANO – Major O.P. Gupta & Captain (Smt.) Sapna Sharma Saraswat. Both institutional and camp training imparted effectively. 35 parades, each of 6 periods, are conducted in college premises as well as at Bn.HQ.,Ravishanker Stadium,Durg ,commencing from last Sunday of July. All subjects as directed by NCC organization are taught. The lessons are delivered by ANO, PI staff of the battalion and also by senior cadets as a part of training and preparation for NCC examinations. Practical Training is given on the ground by PI staff and ANO. (A) Training Syllabus : Training Programme and syllabi is framed by NCC organization at national level. NCC Syllabus covers entire aspects to achieve aims of NCC. It. includes : Drill, Map Reading, Field Engineering, Obstacle; Weapon Training First and Health & Hygiene, Military Organization, National Integration Self Defence, Posture Training and Yoga, Disaster management etc. 3. During various camps (ATC/ALC/BLC/NIC/Pre. RD / RD Group Selection/TSC/Trekking / Parasailing. 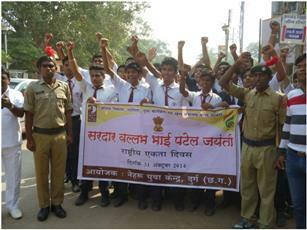 Cadets actively participate in the various camps organized by battalion, NCC group, M.P. 37 C.G. Bn & Directorate and other Director General NCC Camps. Apart from regular parades and camps, cadets participate in social service activities like blood donation camp, Aids rally, blood donation rally, Pulse polio, voters day rally etc. organized by the college unit. 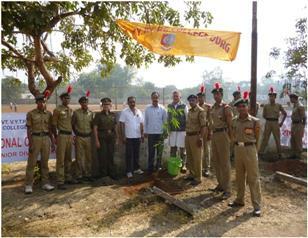 Following are regular annual social activities organized by NCC Unit. Apart from the adventure activities organized by the NCC battalion, the college unit organizes mini treks, Cycle expedition in order to develop team spirit and confidence among the cadets. 1. NCC organization motivates cadets, by offering scholarships and giving them washing and refreshment allowance as per NCC rules of DG NCC to the eligible cadets. 2. In Annual Gathering Programme, our college offers prizes to cadets for their special achievement during various camp activates. 1. 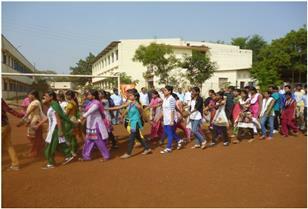 Cadet Participate in the March past parade on 15th August and 26th January in every year at District lelvel. 2. Every year IVth SUNDAY OF November is celebrated as NCC Day. GOLD MEDAL IN GVM SHOOTHING COMP. SILVER MEDAL GVM SHOOTHING COMP.